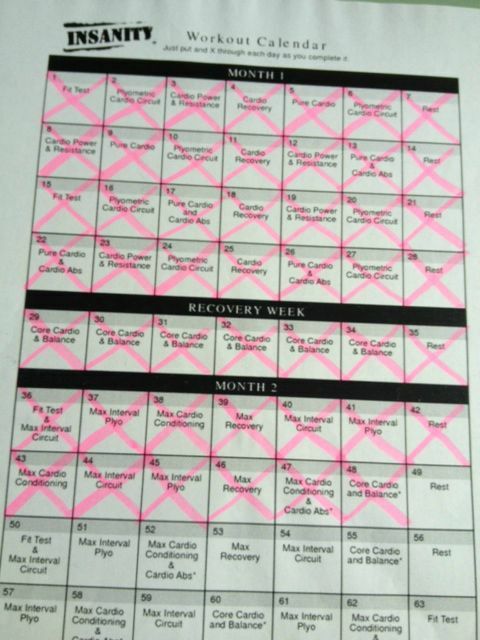 Week 7 has been the toughest INSANITY week for me so far. For some reason, I've been craving the wrong foods, I've not been sleeping well and motivation is seriously lacking. I'm frustrated because I want to feel like I did in the earlier weeks; excited, energized and motivated. I'm hoping that I'll be back to normal next week and can take on the final 2 weeks with lots of enthusiasm. Oh lordy but it was hot today. Suddenly it's a million degrees in Taipei and I was sweating even before we got started. I had no energy for this workout and kept thinking how badly I'd like to dive into a swimming pool. I wish we could turn on the air conditioners, as that would make a huge difference. Boo! I had to skip today's workout (my first one so far) because I've had really bad stomach cramps the whole day. There was just no way I could do it. I might make up for it by doing this workout on Sunday if I'm not too tired. I didn't feel 100% today and struggled to give my all during this workout. It didn't help that I was doing it by myself, as I feel less motivated to work harder. I'm a little frustrated with my body right now, as I have not been sleeping well, which means my energy level is low, and I keep craving junk food. Not the best day, unfortunately. Max Recovery was better for me this week than last. I still worked up quite a sweat, and I'm feeling good now. My favorite workout so far this week! Another 2-workout day. Bleh! I did Max Cardio Conditioning at work and a couple of hours later I did Insane Abs at home. I was seriously considering skipping Insane Abs, because I was so tired. But then I ate a bunch of Oreos and felt guilty, so I did the ab workout anyway. It's tough, and loooong. I better have killer abs when this program is over! Today we had the option of doing the Core Cardio & Balance workout, or Max Interval Sports Training. I haven't done this one before, and I'm so glad I did, because I love it! This is my favorite workout out of all of them, as it's fun and has a big variety of exercises. I think this will be a workout I'll do by myself after I've finished the INSANITY program. Now, we only have 2 weeks left. I'm already thinking about what I'm going to do after I finish INSANITY. Do INSANITY:Asylum, P90X, try something totally different or go back to the gym? I'm not sure yet. All I know is that I won't be able to do these workouts at work much longer. The humidity is really starting to take its toll, which means I can't give 100% when I'm working out. I'll have to do it at home where I can turn on the air conditioner. Some of my friends have started INSANITY recently, and I'm so excited for them! I wish you guys the best, and don't forget to "keep pushing" even if you feel like you can't. your almost done, keep up the good work!! I would have loved to see a before and after picture. I am think about purchasing it myself. I can't believe I'm almost finished with the program! I did take some before pictures and will definitely take after pictures, but I still have to decide whether I'm going to share them here. I'm too shy! haha!